We all know we cannot adopt every dog who pulls on our heartstrings, but we can still make a profound difference on animals in need. Our bulldog sponsorship program allows you to make a tax-deductible donation which will support one of our special foster pets! Many of our rescued dogs have veterinary expenses that exceed the amount of their adoption fees. Your contribution will assist in offsetting these costs and ensure that we can continue to save more bulldogs going forward! Sponsorship directly supports the particular dog of your choosing which means your contribution will not be allocated to other program funds. ​What Do You Get Out of Sponsoring? Even though you're not adopting, you still receive the joy of knowing you helped provide care for the animal(s) you choose to sponsor. Because of generous people like you, The Good Life Bulldog Rescues can continue to save bulldogs who may otherwise be euthanized, neglected, or abused. Upon your request, we are happy to send you any updates on the dogs you sponsor so you can learn about your impact firsthand! As a sponsor, you can establish recurring monthly donations that will help different bulldogs throughout the year, or you can make a one-time contribution. Once you've decided you want to sponsor a bulldog, visit the animal you want to sponsor below and then click the "Sponsor" button. Once there, you will be able to choose the amount of your sponsorship and designate one-time or recurring payments. 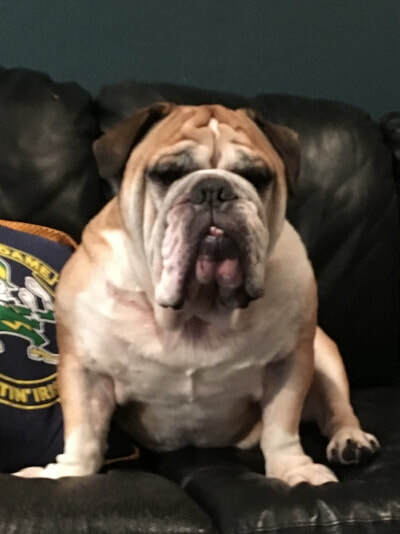 If you select a recurring payment, we will notify you if the bulldog you have selected to sponsor gets adopted so you can then decide how you would like your monthly donation be used. We ask for a minimum of $10 to sponsor any dog and you can sponsor as many dogs as you would like. Please specify in the comments if you would like your name listed as a sponsor under your chosen dog, if you would like updates and any message you would like to include for them as well! The Bully Welcome Bag includes all of the essentials that any dog that is new to TGLBR will need to get settled. Many of these dogs come to us with nothing, no toys, no beds and certainly no monthly preventative medications. Your $50 sponsorship will provide each new dog with a blanket, a leash and harness, toys and a month supply of heartworm and flea/tick preventative. Our goal is to help each dog become comfortable in his/her foster homes as soon as possible and these items really do help. Curious Where Your Donations Go? Dogs with any existing medical conditions like cherry eye, entropian, corkscrew tail, ear infections and/or allergies carry additional veterinary costs which quickly add up. We also need crates for fosters, blankets and towels and cleaning supplies. We need your support to make sure we can continue to help them all! Thank you! The following dogs are looking for sponsors. Please click the button below to sponsor, you can leave a note as to which dog you would like to sponsor, or if you'd just like the money to go to welcoming new dogs to the rescue.